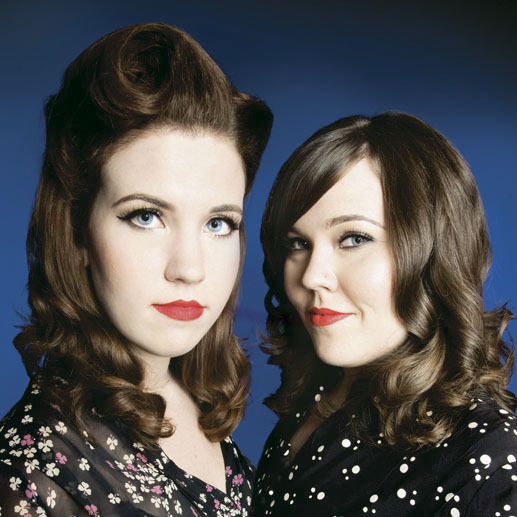 The latest release in Third Man’s 7” Blue Series showcases the outstanding duo The Secret Sisters. Real life siblings Laura and Lydia Rogers are brand new on the music scene but once you hear them sing, you’ll swear they’ve had to have been at this for years. In all actuality they have been singing together for a long time, it’s just been at church, family parties and around their house. But as soon as they decided to pursue it as a career, there’s been no shortage of enthusiasm, excitement and support surrounding these ladies. Their debut album, set for release later this year, is being produced by none other than the legendary T Bone Burnett. But first, they’re putting out a single produced by Jack White. With the vote of confidence from those two working on their stuff, you can bet The Secret Sisters have something special in store for everyone. Side A of the single is a gloriously raucous cover of Johnny Cash’s “Big River.” Being a fan of Johnny Cash, Jack White and vintage country music as a whole, this track really gets me going. Sung as a duet, Laura and Lydia’s voices have a unique airiness and a crystal clean tone that reminds me of the great country songbirds of the 50’s and 60’s. They have the kind of tight harmonies and unique blending that can only be found in siblings and their vocal chemistry will definitely end up being their calling card. Jack adds some of his unmistakable, unimitatable guitar skills and they whole track sounds really amazing. Side B is a great version of the old folk song “Wabash Cannonball” made famous by The Carter Family. Again, the joint vocals are just incredible and if anyone’s looking for a new group to fill that Andrews Sisters-shaped hole in your life, look no further. While many groups are trying to recreate the sound of the bygone days of golden country oldies, The Secret Sisters are quickly charting their own path to the top of the mountain.